Trees Adventure is Australia's premier tree top adventure ropes experience. Only an hour from Geelong, this site features a double decker Home Tree where you'll start high up in the trees! Come and experience breathtaking flying foxes and navigate your through the native bushlands of the Otways! Our 5 parks around Australia feature exciting and challenging obstacle courses high up in the tree canopy, that will have all the family swinging, leaping, climbing and flying through the forest - allowing thrill seekers and nature enthusiasts to experience the trees like never before! Our sessions run for 2 hours (including training) from 4 years and up meaning there is different course for the whole family to enjoy! Early arrival of around 20-30 minutes beforehand is important for gearing up so we can get you started on time. 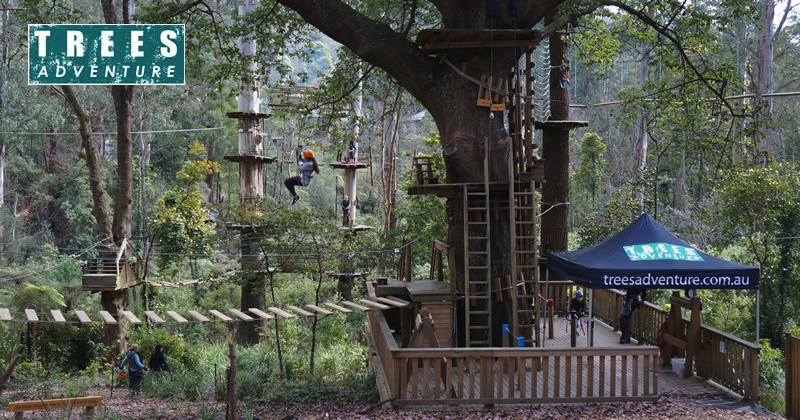 You will then get to choose which of the tree top courses you'd like to experience at Trees Adventure. In rain, hail or shine, you can find us in Victoria, New South Wales, Western Australia and NOW TASMANIA!